June is National Dairy Month! This month I am partnering with the Florida Dairy Farmers to talk to you about our Florida Dairy Farmers. There are more than 130 dairy farm families who are both men and women. They take care of their cows, are stewards of the land and most are leaders in their respective communities. Most of the dairy cows in Florida are Holsteins, you know the black and white ones we see all of the time. They aren’t the only kind however so if you want to meet the cows, go here. Dairy herds in Florida range in size from 150 cows to 5,000 cows. There are about 123,000 dairy cows in Florida that collectively produce about 2.34 billion pounds of milk a year. 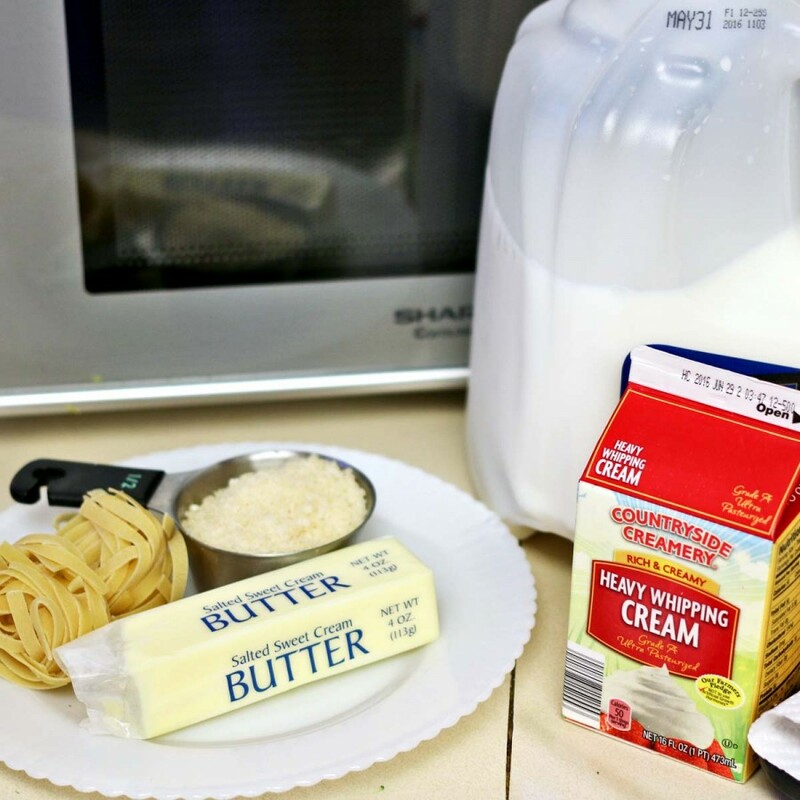 The total represents 277 million gallons of Florida-produced milk in the grocery store. Each Florida dairy cow produces about 6-8 gallons of milk each day and is milked 2-3 times per day. Most of the dairy farms in Florida are in Lafayette and Okeechobee counties. The state’s more than 130 dairy farms are primarily owned and operated by second and third-generation farmers. Milk contains 9 essential nutrients and vitamins: protein, vitamins A, D, and B12, calcium, potassium, phosphorus, riboflavin, niacin, zinc, and magnesium. Drink 3 cups of milk a day to get your recommended daily allowance for dairy. 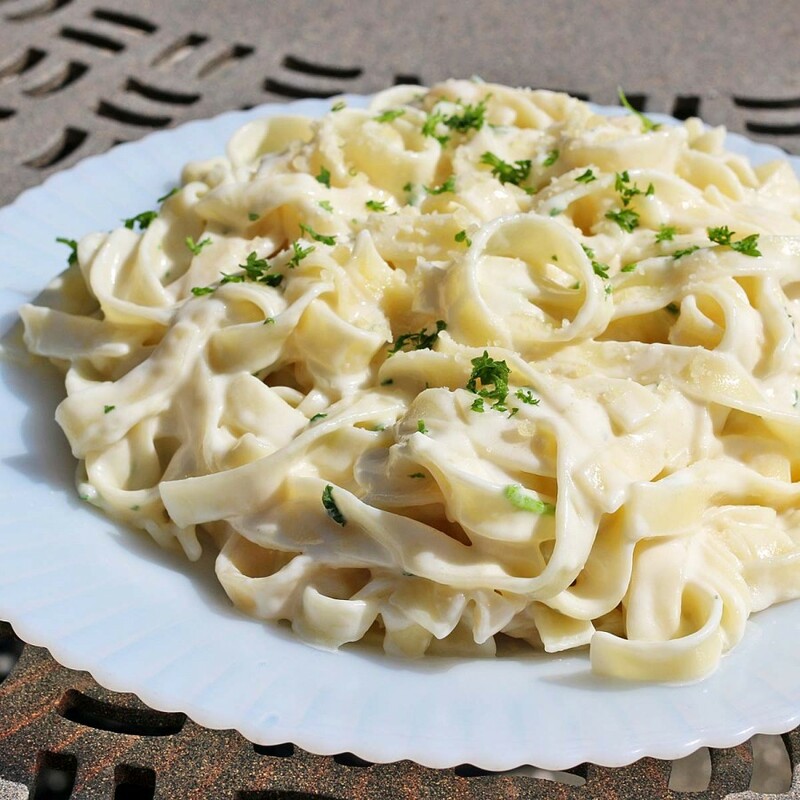 I’m sharing my recipe today with you for Fettuccine Alfredo. When you need a quick and fast dinner try this easy recipe. Gather your ingredients. Milk, Heavy Cream, Butter, Flour, Salt and Fresh Grated Parmesan Cheese. Grating your own Parmesan cheese is easy with a hand grater or using your food processor. It will make a difference in your finished product. When grating your cheese be sure to save the rind piece and throw it in a pot of vegetable or minestrone soup for additional flavoring. See the little dot on the surface of the Alfredo sauce? That’s the fresh grated Parmesan cheese right before it melted into the sauce. Whisk the Parmesan cheese over low heat to keep it from getting stringy. Here’s a tip I’ve shared before but it bears repeating. When chopping fresh parsley when it is chopped wrap it in several thickness of paper towels or cheesecloth. Then rinse the parsley under cold water and wring it dry several times. It gets dry and fluffy and won’t tint your sauce green. Often I do a whole bunch of parsley and leave it in the refrigerator. It will last several days when done this way. Melt the butter in a saucepan. Stir in the flour until it is well coated with the butter. Add the heavy cream. Cook for 3 - 4 minutes. Add the garlic, salt and milk. Stir until well mixed. Do not let boil. Add the fresh parmesan cheese and parsley. 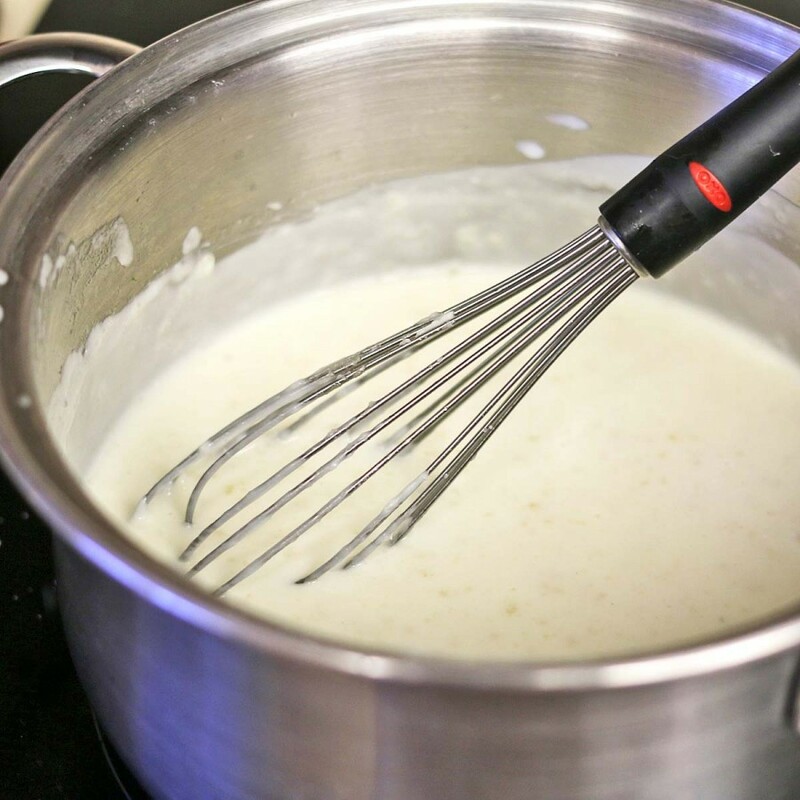 Whisk until cheese is melted into the sauce. Cook the pasta until ala dente. Add the sauce. 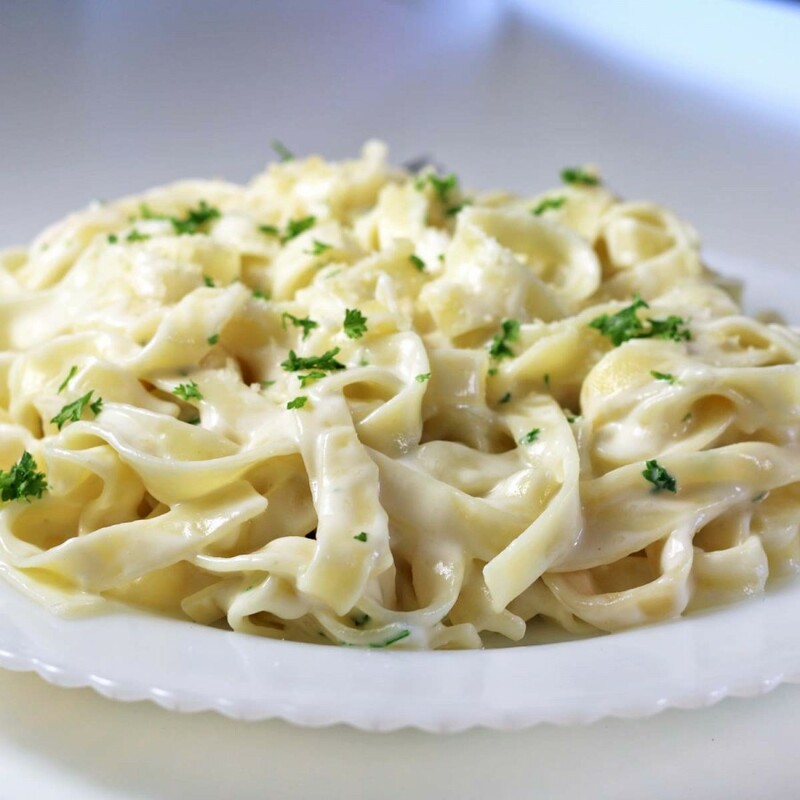 One of my very favorite indulgences is Fettuccine Alfredo! Great tip on the parsley. I’ll try that. Thanks! This looks incredibly creamy and delicious! I love the tip for parsley! I’m going to give that a try next time! 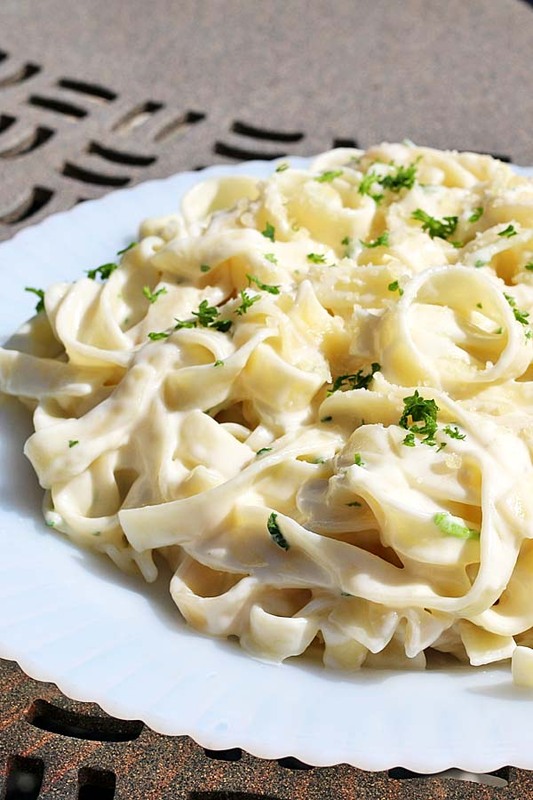 I was a hugely picky eater as a kid, but fettuccini alfredo was one dish that I would NEVER say no to. This recipe brings back all kinds of yummy childhood memories! I don’t know why I have never made my own Alfredo sauce at home, it’s so easy!! I love your version, and definitely need to try it! Sometimes you just gotta do what makes you (and your kids) happy. And for me, that’s going crazy on a big bowl of creamy Alfredo pasta. I LOVE this recipe! This is a classic recipe! It’s just creamy comfort goodness! Great tip on the parsley too. I’ll have to try that next time.